Tufts women’s soccer traveled to Williamstown, Mass. on Saturday to face undefeated NESCAC powerhouse Williams. This was an especially important match up for the Jumbos, who have struggled against the Ephs in recent years, with their last victory coming in 2006. Heading into the weekend, Tufts was ranked third in the NESCAC with a league record of 5–1–2 while Williams sat comfortably in first place with a league record of 7–0–1 and an overall record of 12–0–1. Having one of their best seasons in recent years, the Jumbos hoped to earn their first victory over the Ephs in 11 seasons. Heading into this matchup, the Jumbos knew it would be one of their most challenging tests of the season. “[Williams] has always been a good team in the past, so we knew it was going to be difficult,” first-year forward Liz Reed said. Junior co-captain midfielder Emma Ranalli echoed a similar sentiment. In the practices leading up to this game, Tufts adjusted its game strategy in hopes of competing more effectively against Williams’ style of play. Tufts struggled with this unfamiliar strategy, however, ultimately reverting back to its usual style of play about 20 minutes into the first half. “We realized slowly — unfortunately a little too slowly — that we weren’t as dangerous playing directly to our forwards as we needed to be,” Ranalli said. Once they settled back into their usual style of play, the Jumbos were much more competitive against the Ephs, as they were able to pressure them more effectively. Sophomore midfielder Jenna Troccoli had two shots on goal for the Jumbos in the first half in an effort to break the 0–0 tie. Troccoli’s efforts fell short as her first shot was wide and the second was saved by Williams’ goalie. A pass across the box followed by a quick finish by junior forward Kristina Alvarado against Tufts’ junior keeper Emily Bowers in the 28th minute gave Williams a 1–0 lead heading into the second half. In the second half, Tufts did a better job of keeping the ball and pressuring the Williams back line. The Jumbos prevented the Ephs from scoring for the first 16 minutes of the second half, as the score remained 1–0. Two quick goals from Williams in the 62nd and 64th minutes put Tufts at a 3–0 deficit with less than 30 minutes to play. Senior midfielder Evan Gancedo scored the second goal for the Ephs, and Alvarado added her second of the day to put Williams up by three goals. Neither team scored for the remainder of the competition, as the game ended in a 3–0 loss for the Jumbos. Despite not getting the result they hoped for, the Jumbos have reason to be happy with their performance, as they did a good job of being competitive against a top-level team. They attempted 10 shots to Williams’ 14, and the teams were even on corner kicks, with four each. Following this loss, Tufts moves to fourth in the NESCAC standings. The Jumbos will play their final regular season game at home against Bowdoin (9–4–1, 4–4–1 in conference) on Tuesday before postseason play begins. The Jumbos are excited to have a quick turnaround from this weekend, as they hope to collect a win against the Polar Bears to regain confidence as they prepare for postseason play. 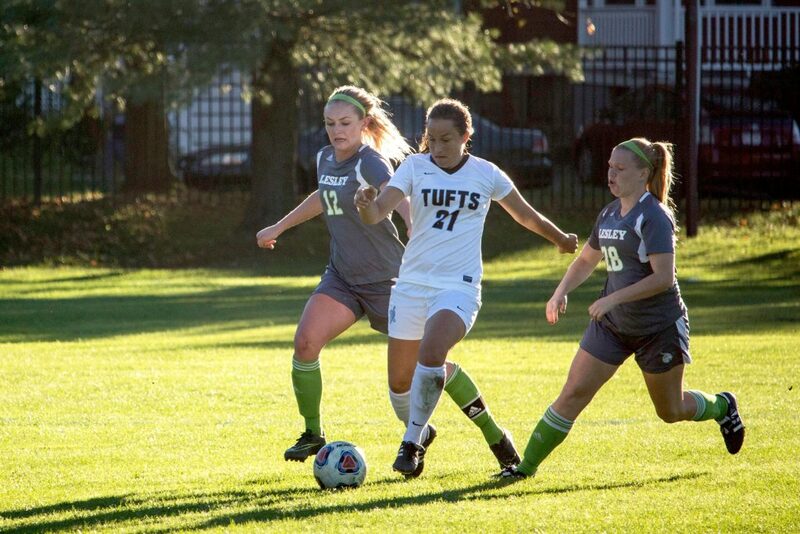 Having only lost two in-conference games in what has been one of its best seasons in recent years, Tufts is in a position to play deep into the postseason. “We are super excited to go into the NESCAC tournament in a better position than we have in the last couple of years,” Ranalli said.